Vintage will need all our available volunteers during the afternoons of Friday, Saturday, and Sunday. Federal regulations require that the Burn Line (visitor do-not-cross viewing line) be moved west each of these days to accommodate the larger aerobatic box needed by the high-speed jets. The following information from EAA Headquarters details the procedures which will be implemented each of these days. The U.S. Air Force Thunderbirds’ announcement last December that Oshkosh was on its 2014 schedule brought a lot of excitement to those coming to AirVenture this summer, but it also created some unusual logistics challenges for EAA and Wittman Regional Airport. The solution was community cooperation and creative thinking to make it possible. There will be full access to the entire flight line until 1:30 p.m. on Friday and Saturday, August 1-2. However, there will be announcements and signs informing those who set up chairs and blankets in front of the Thunderbirds crowd line that they should set up behind that line. From 1:30-5 p.m. on Friday and Saturday, the area between the Thunderbirds crowd line and the regular crowd line will be cleared of people, except those needing access to their aircraft. Those people will be escorted to and from their aircraft. From 5-6 p.m. on Friday and Saturday, no one will be allowed between the Thunderbirds crowd line and the regular crowd line. 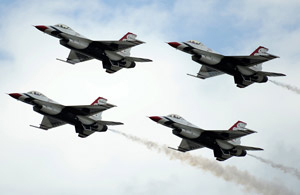 Following the Thunderbirds’ performance, operations will return to normal. In addition, the entire aircraft parking area and Seaplane Base bus stop south of the ultralight airstrip will follow the same restrictions schedule. That will allow the Thunderbirds entry and exit from the aerobatic box. On Sunday, August 3, the crowd line will be moved at noon and the no-access time will be 3-4 p.m., because of the earlier start to the air show and the Thunderbirds performance that day. The community cooperation with AirVenture came on the east side of the airport. As the expanded aerobatic box included business and residents adjacent to the airport, EAA worked with them to provide viewing and hospitality areas near their facilities. EAA also worked with the Thunderbirds to schedule performance times that had the least effect on the businesses on the airport’s east side. Click here for more information on special EAA Thunderbird Airshow site restrictions on Friday, Saturday, and Sunday afternoon.